Looking to use your Xbox One controller to play some PC games? While a keyboard and mouse is objectively better for first-person shooters, other genres such as platforming games work best with a controller. Thankfully, it’s even easier to use an Xbox Controller than it is a PS4 controller. Option 1: Use a USB cable. Simply plug a microUSB cable into your Xbox One controller and plug the other end into a USB slot on your PC. On Windows 10, your computer should recognize the controller instantly. On Windows 8.1 or Windows 7, Windows should automatically download drivers and your controller will be ready in a few moments. Option 2: Use the Xbox Wireless Adapter. Microsoft has a new standard called Xbox Wireless that’s built into a few computers, but there’s a good chance it’s not built into yours. If you want to connect wirelessly, you’ll need to buy the Xbox Wireless Adapter. Plug it into a USB port on your PC and let Windows install drivers. Then, press the button on the adapter, turn your controller on, and press the Bind button on the top of the controller to link it. Option 3: Use Bluetooth. You can only use Bluetooth to connect a controller to Windows 10. You must have the newer model of Xbox One controller, as shown in the below image. Enable Bluetooth on your PC How to Set Up Bluetooth on Windows 10 How to Set Up Bluetooth on Windows 10 Do you want to pair a Bluetooth device with Windows 10? We'll show you how to set up Bluetooth and Dynamic Lock on Windows 10 and help you troubleshoot. Read More (Settings > Devices > Bluetooth & other devices), then press and hold the Bind button on your controller for a few seconds to put it into pairing mode. Note that after you connect your controller to a PC, you’ll need to re-pair it with your Xbox next time you use it. You can connect the controller to your Xbox using a USB cable and press the Xbox button to pair. Or press the Connect button on the system (to the left of the disc tray on the original Xbox One, and on the bottom-right for the Xbox One S and Xbox One X) followed by holding the Bind button on your controller. 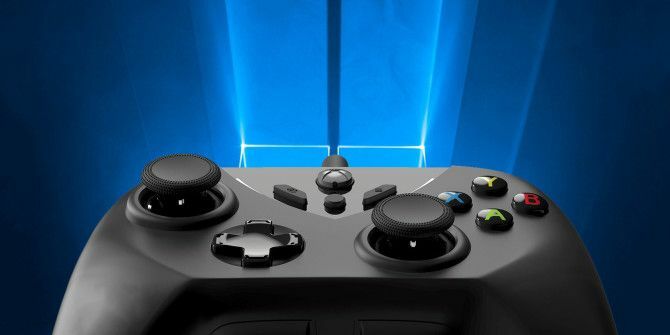 Check out our full article on using your Xbox controller with Windows 10 How to Set Up Your Xbox One Controller With Windows 10 How to Set Up Your Xbox One Controller With Windows 10 Microsoft has made it very easy to use an Xbox controller on Windows 10. We show you how to connect it through USB or wirelessly. Read More for more details. In addition to hooking it up to your PC, you can also connect your Xbox controller to your Android device. Which of these methods is your favorite to connect an Xbox One controller to your PC? Which games do you play with it? Tell us in the comments!